The section reproduced here is from my page about waterproof watches. A Swiss "brevet", abbreviation "Brev. ", or patent No. 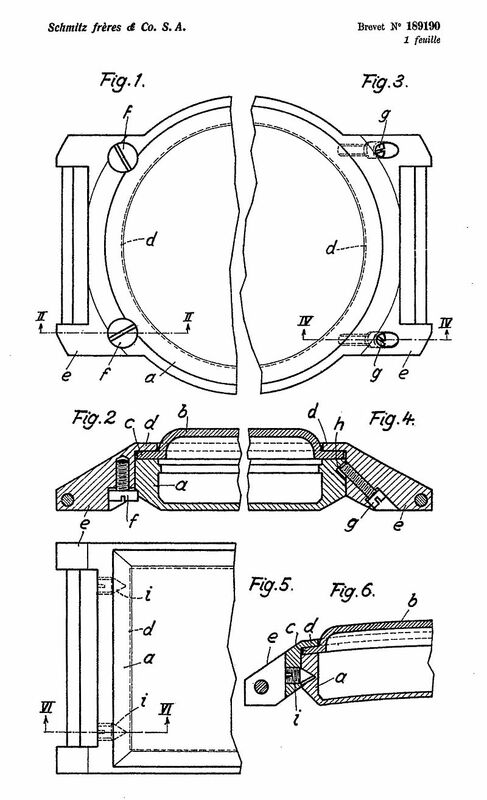 189190 for a waterproof case design with a distinctive "four-screw" method of retaining the case back and applying compression to a gasket between the back and the crystal was granted to Schmitz Freres in 1937, with a priority date of 11 May 1936. Reference to this patent is seen in watch cases with the legend "Brev. 189190", usually accompanied with the Swiss Fedreral cross sign . The basic idea of the patent was to use four screws to clamp the back to the body of the case. To assemble a watch the case back and crystal were dropped into a recess in the case body, and the four screws were tightened down to hold the case back in place, and also to put pressure onto the joint between the case back and the crystal, making a waterproof seal. The figure from the patent reproduced here shows how this was achieved. Figure 2 is a cross section, the case back is item "a" and the crystal is item "b". There is no gasket shown between the case back and the crystal but I am sure that one would have been necessary to achieve a waterproof seal. The figure shows that the patent covered three different ways the screws could be arranged to clamp the case back. Figure 2 shows screws "f" inserted vertically, the screw head pulling the case back into place. Figure 4 shows screws "g" inserted at an angle of about 45 degrees and bearing on a notch cut in the side of the case back. Figure 6 shows screws "i" with a tapered or pointed end which enters a tapered groove on the side of the case back, the sloping contact between the end of the screw and the groove providing the clamping force. This would have been the most difficult of the three designs to manufacture, and it is no surprise that one of the other arrangements is the one that is seen. 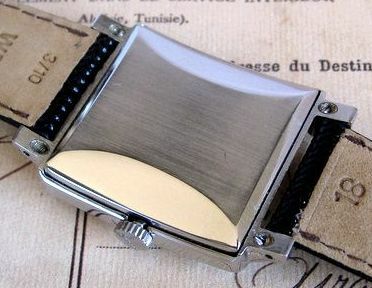 This design of watch case was used in the Gallet Clamshell, Gallet's first water resistant chronograph. David Laurence of the Gallet Group, told me that old advertising and catalogues as well as notes taken during interviews with Bernard Gallet before he passed away showed that Gallet purchased the rights to this patent in early 1937. Manufacture of the cases began in Gallet's factory in La Chaux-de-Fonds later the same year. 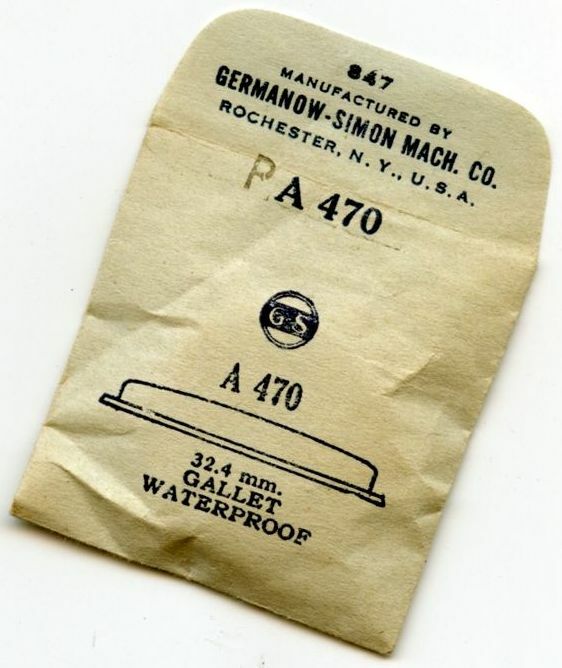 An interesting detail is that Gallet had the specially flared 32.4mm crystals for the Gallet Clamshell manufactured by Germanow-Simon Machine Company in Rochester, NY, not in Europe. At the time, Gallet's American headquarters were located in nearby Manhattan, and Gallet's waterproof watches were originally assembled in new York from Swiss components, circumventing customs duties imposed on imported Swiss watches. Cases of this patent waterproof design were used by a number of other watch manufacturers, and the patent number 189190 appears in watch case backs. These are often referred to by collectors as clamshell cases after the Gallet original. The name was probably chosen in the same way as Hans Wilsdorf chose "Oyster" for the first waterproof Rolex watch, not because the shape resembled an oyster or a clam but as an allusion to something that was happy under water. However, "Gallet Clam" doesn't really sound quite right, so "Gallet Clamshell" was chosen, the added "shell" conveying an idea of a protective outer case, as well as being shut up clam tight. They were made in a range of sizes, and shapes round and rectangular. The design is not as good in principle as a screw back, because the clamping force is applied to four separate points and the case back must be made sufficiently strong that adequate clamping force is applied to the gasket mid way between the clamping points. A screw back is a better solution for a round case because the pressure is applied evenly all the way around the case back joint by the screw thread. The 189190 case design does however lend itself well to "forme" or shaped cases, which are difficult to make waterproof. 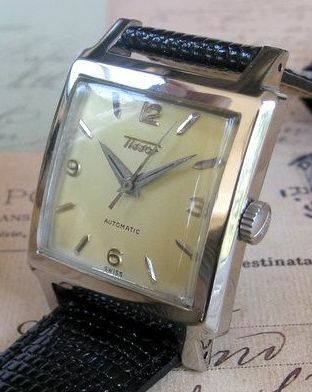 The pictures here show a Tissot watch in a rectangular 189190 case with this method of sealing.